A Makeup & Beauty Blog – Lipglossiping » Blog Archive Don't miss another post! 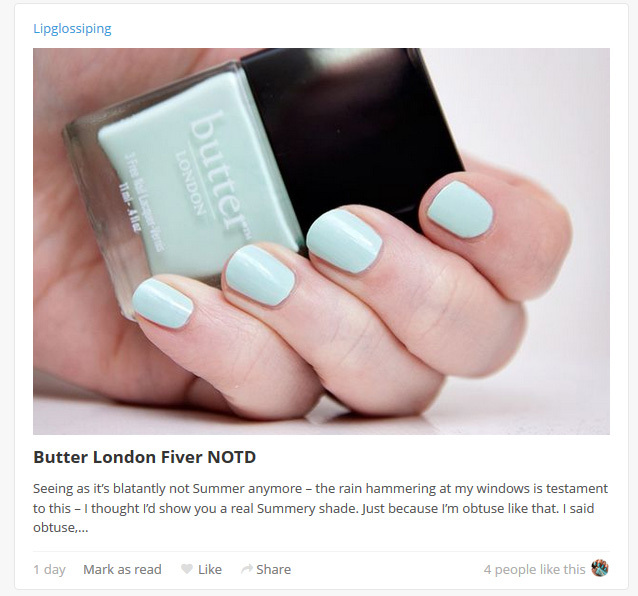 Bloglovin‘ is an easy way to find and store all of your favourite blogs in one place. It’s quick to log on and check for updates, giving you the gist of a post so you can decide whether or not you’re interested in clicking through to read more. Any posts will be waiting for you to read from the comfort of your email inbox whenever you get a spare minute. 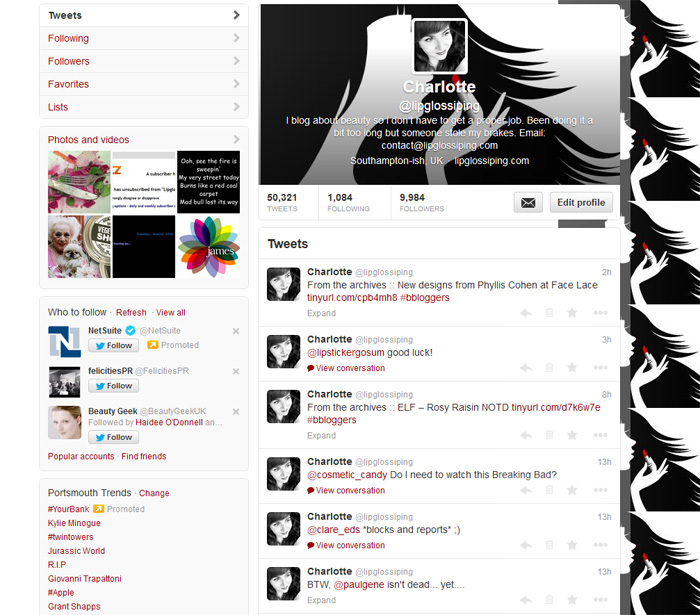 Incase you don’t know, I’m a wee bit of a Twitter addict (50,000+ tweets and counting!) If you have any questions or want to shout at me about something, this is the best place to find me! I use Twitter to promote my latest posts with a single link and automate a couple of links a day to older posts that you may not have picked up on the first time around. Twitter is also where I link extremely time-sensitive info (deals, voucher codes etc.) and retweet lots of completely and utterly fascinating (honest!) snippets that I discover! 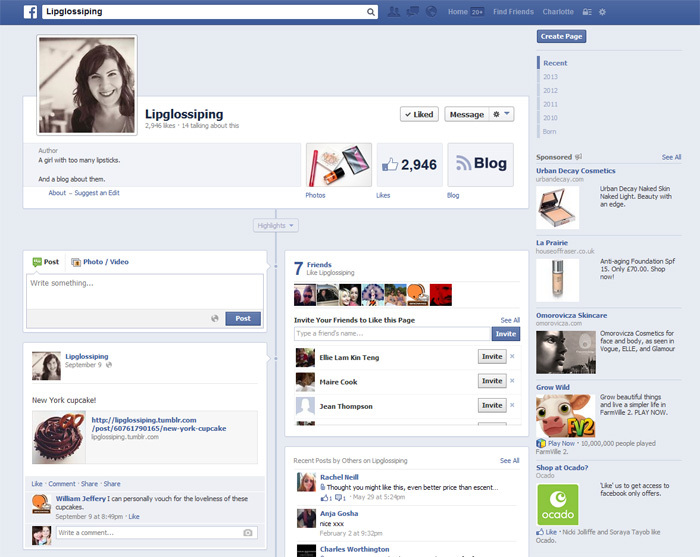 I don’t really use Facebook if I’m honest…. but if you’re an avid fan, you can follow my page which will, by the power of the magical internet, feed my latest updates into your timeline. 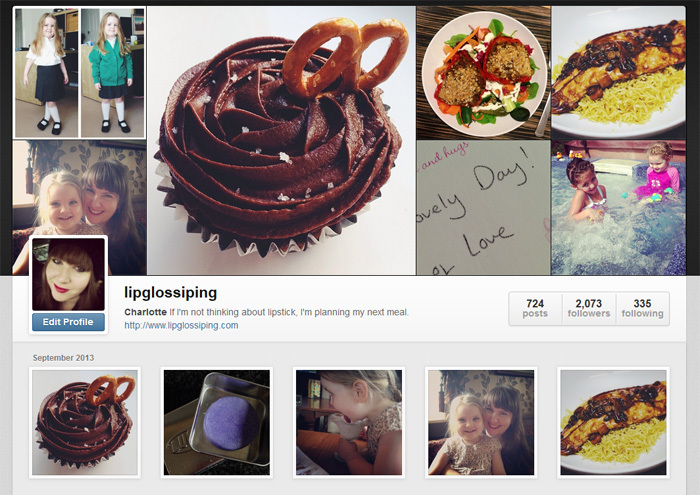 My Instagram account is more personal than blog-related. Generally involving attempts at healthy and not-so-healthy(!) dinners and treats, a wee bit of Leila’s antics and not much else! However you choose to follow my blog, if you do – thank you very much! 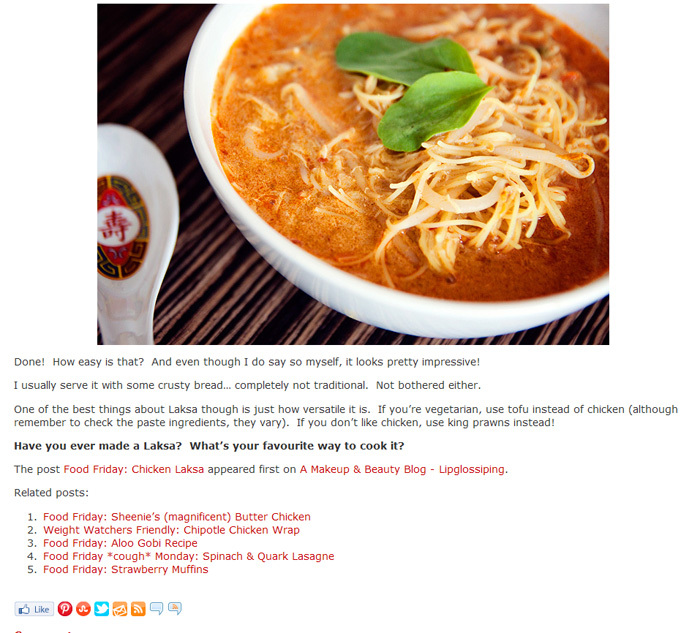 I have followed via bloglovin (gfc before they took it away) for a few years, back when I think your layout was pink I think. Also with Twitter. Your website used to be one of my favourites. Lately you have hardly posted much (I understand you are pregnant though), but so much of your twitter seems to be ‘from the archives’ with the odd follow me on Bloglovin, I don’t understand the push for followers when you post so rarely now. You’re right: October, November and December were very lean months (for me) with a total of 21 posts spread over those 12 weeks. Since the loss of GFC, my subscriber numbers have obviously fallen and I didn’t bother pushing or promoting another RSS subscription service so I left it to my email subscription service (which I pay for) to deliver new posts to subscribers. I finally “claimed” my blog on bloglovin’ over the weekend and have started using it myself to follow the blogs that I read daily, I guess this is why the thought of “pushing for followers” is at the forefront of my mind right now. Also, with regards to the “from the archives” tweets, I have that set to automatically tweet the links to 3 old posts a day with an 8hr gap between tweets which I don’t think is too excessive but I’m always open to arguing that point! I’m actually very active on Twitter but perhaps this is more in @mentions to people than direct shout-outs. As far as I’m aware, I’ve only tweeted about Bloglovin’ twice though? Compared to most bloggers, I’m actually pretty non-commital about “pushing” my blog hard! I’m hoping to rediscover my love for blogging this month and have been posting regularly but won’t deny that I’ve lost my place somewhat and am feeling a bit old and repetitive compared to my peers. I’ve promised myself to give it a good shot before deciding whether or not to hang up my blog for good… but either way, I appreciate anyone who has followed in the past and can only apologise if I’ve managed to irritate. I’m sorry if I seemed to offend in any way. When you put down its not overly excessive, it must be just I’ve been on twitter often when your tweets have come up. Again I’m a long time reader and follower and really hope you do get your blog back to where it was, or to a level you enjoy. I very much enjoy your writing style and I respect a more mature/wise opinion of someone a similar-ish age to myself. Please don’t apologise, you didn’t offend. You just caught me on a bad day and touched a(n oversensitive) raw nerve as I flounder between wanting to get back into blogging with the same passion I used to have and wanting someone to pull the plaster off quickly and be done with the damn thing. Another thing re: Twitter, I suppose it’s super-relative to how much activity you see on your timeline… I follow hundreds of active users and things move very quickly for me but I can imagine that if you only follow a handful of people, my 8hrly tweets would be a bit much! Give her her a break. Not everybody has the time to post seven times a day, every day. Blogging isn’t easy. Charlotte, the quality of your posts have never faltered ONCE in your five years of blogging, and I’ve rather see you blog five times a month than not at all. I also see you interact all the time on Twitter and not just push ‘Follow Me’ style tweets. Life is always more important than blogging, blogs and followers and I’d rather just move on and follow other blogs than make a point to complain. I think the rate you do post / tweet is astounding given the fact you have a young family AND currently pregnant. Winner Winner Chicken Dinner! (Or, cleanser).